← 449 "Oh Brother, Where Bart Thou?" Homer walks onto a metal circle, it actually is a pinball starter mechanism and he started bouncing eventually going into Moes and the rest of the family comes out eventually falling down and Maggie shortly comes up then comes back down. Instead of the usual music of the choir singing "The Simpsons," the "Miss Gulch/Wicked Witch of the West" theme from the 1939 film The Wizard of Oz is heard as Agnes Skinner rides her bicycle across the title. "Thursdays with Abie" is the ninth episode of the twenty-first season. It originally aired on January 3, 2010. The episode is the 450th episode produced. Mitch Albom had a cameo appearance as himself. "A Springfield Shopper reporter takes an interest in Grampa's stories, making him front-page news, which makes Homer jealous, until he discovers what the reporter has in store for the final column; Lisa loses the classroom stuffed lamb she was watching for Bart – down a sewer drain." 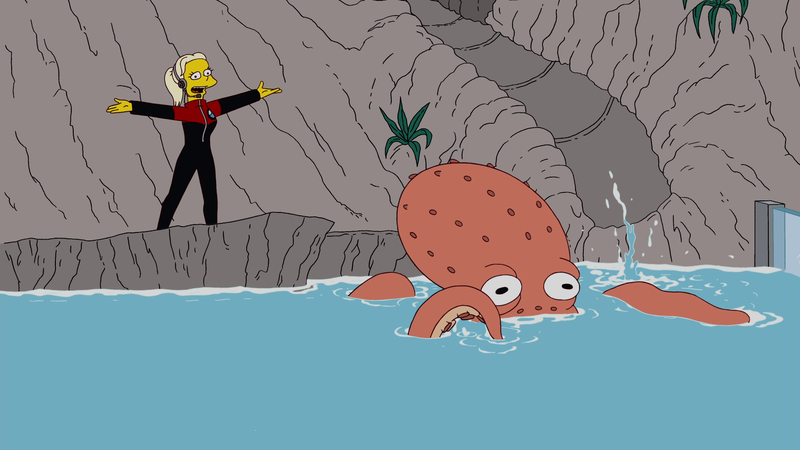 The episode begins with the Simpsons go to the aquarium. They decide to go see Slimu, a performing octopus, while Grampa sits on a shark bench. There, Grampa meets a man named Marshall Goldman who is interested to hear Grandpa's many stories. 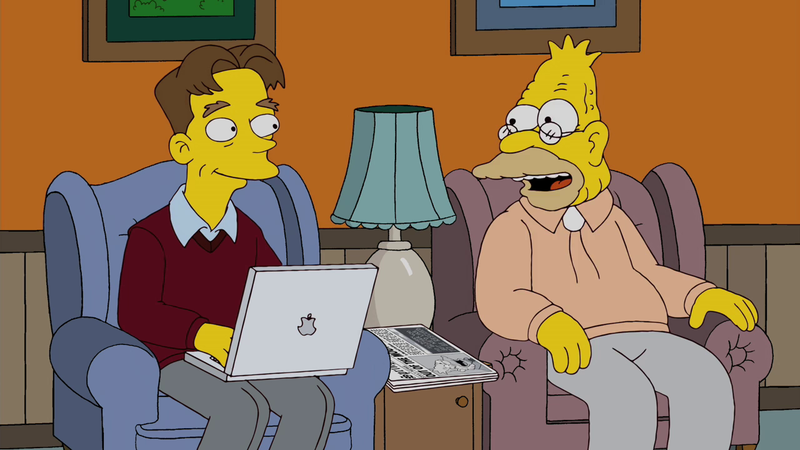 Grampa tells him about the time when he tamed a shark and Marshall publishes it in the Springfield Shopper newspaper. Homer reads about it and is shocked that Grampa wouldn't tell him and becomes jealous of Marshall. Meanwhile, Bart is chosen to take Larry, the classroom stuffed lamb, home, but Lisa decides to care for it. However, she accidentally throws it into the sewers. Grampa tells him of the time he met Clark Gable, the lead actor of "Gone With the Wind" (not famous yet at the time). Homer grows even more jealous and decides to write an article of stories from some other person. He decides to try Mr. Burns who feels appreciated that someone actually stopped by to listen to him. He says that he will release a hound, which chases Homer off. He then heads to the newspaper office to submit his office. While the secretary goes to "approve" his article (which she really is just shredding it), Homer walks into Marshall Goldman's office. He discovers an article that will win him a Pulitzer Prize, which is a story of Grampa dying. Homer realizes that Marshall wants to kill Grandpa so he can win a Pulitzer Prize. He runs to stop them at the train station (where the story says he'll die while riding the train). Grandpa gets onto the train that the famous "Gone with the Wind" star rode with Marshall. Homer tries to chase it, but can't quite make it. So at the next stop, Lenny, Carl, and Homer jump onto the top and lower Homer into the car. There, he sees Marshall go to smother Grandpa with a pillow. Marshall realizes Homer is there and pulls out a knife (which he later rips the pillow with to show a gun). Then Grandpa gets up and hits him in the head with some wood, which has no effect. Finally, Grandpa fakes surrender by holding his hands up and then pulling the emergency brake, in which the resulting force knocked Marshall to the wall of the train, where he is buried by hat boxes. Homer apologizes to Grandpa for being jealous, and Grandpa accepts it. Lisa tries to have Bart not notice Larry's absence, but Bart figures it out immediately. He at first suggests to not bring it back, but Nelson walks by and tells Bart that if anything happened to Larry, he would "unleash a dark side of him that no one knows about". So Bart goes into the sewer to look for Larry. There, he is chased by sewer rats, and then sewer cats. Then he finds Larry and zip lines on a pole to escape. But then Larry rips in half and Bart wails that he destroyed it (mainly because he began to find a liking to it). Later, the entire family sit down in the living room and Grandpa tells Homer that he thinks that he is ready for his first ramble. Homer states that he's been waiting for this moment all of his life. He then tells in a Grandpa style the story of Godzilla as the credits roll. IGN gave it a 8.4/10 and saying that "Overall, the episode was a success, using one of the best Simpsons running jokes to tell an engaging and even sentimental tale". Modified on July 16, 2017, at 02:54.